Hey, maybe you haven’t heard—since, you know, the hysteria-industrial complex only reported it 23/7—but it’s been cold. Not just cold. C-c-c-c-c-cold. When just going outside to let the dog do his thing requires two layers and ends with crystalized eyelashes, going out the store—or out to eat—is out of the question. I know I’m not the only one out there who decided over the past week to raid the pantry and set a big pot of something to simmer on the stove. But what? Soup? Red gravy? Bolognese? My first cabinet find was a pound of dried black beans. 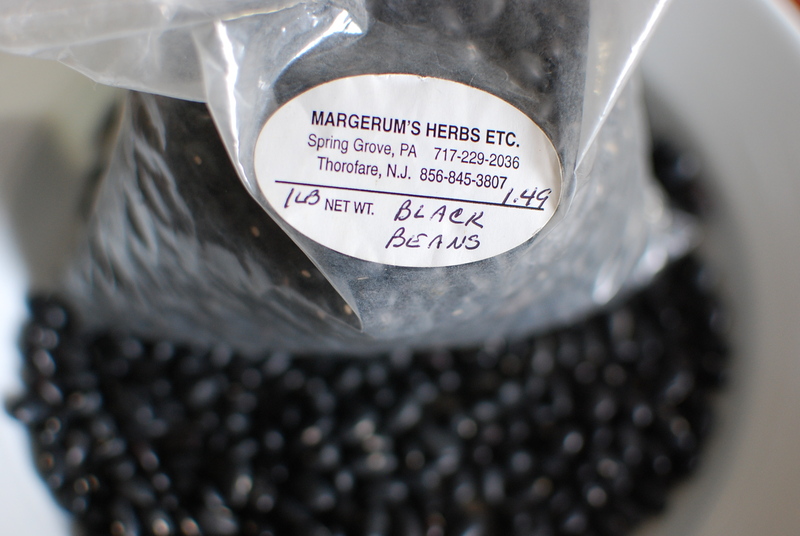 I picked up these dried beans at a farmer’s market last fall. 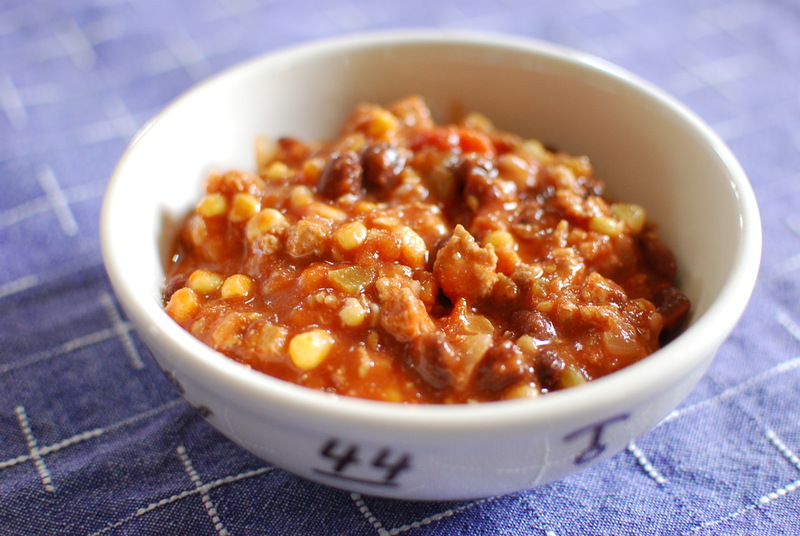 What about a chili? I had jars and jars of tomatoes, but thought I remembered freezing a few packets, too. And when I pulled out the freezer’s designated veggie drawer to find them, a pound of Griggstown ground turkey made its presence known (just missing, thankfully, my big toe). Before I shut the door, I also grabbed a vac-bag of that sweet corn I’d put up in July. 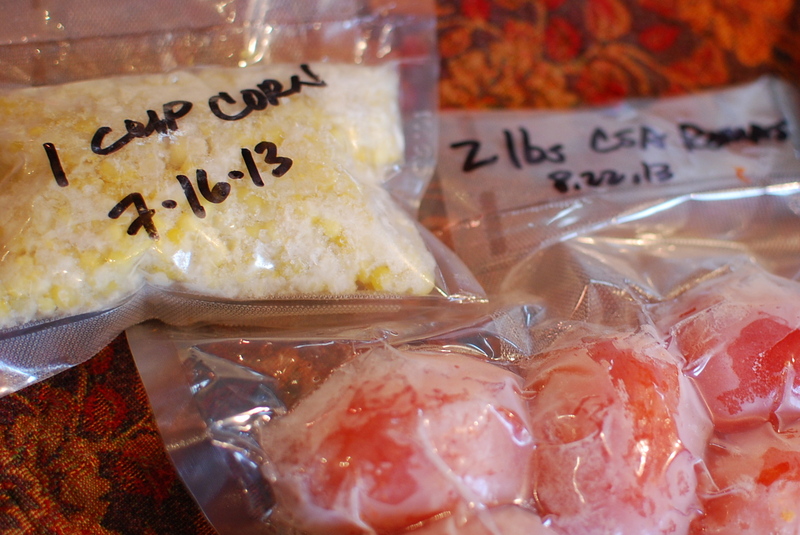 Frozen CSA corn and tomatoes reporting for duty. Now, chili’s a very personal thing. Of course, it’s also a very regional thing. Everybody’s got rules about the presence of beans, and whether you can stray from kidneys or not, about whether meat has to be cubed or ground, about whether you can use anything but beef. Sue me in a Texas court, but to me, if it’s a stew that has cumin and dried peppers of some kind—and if it makes the house smell great and makes my tummy warm on the coldest day of the year—then I can call it Chili. Just guidelines here—use what you’ve got, and spice it to taste. Garnishes could be shredded cheese, sour cream, plain yogurt, chopped scallions, cilantro. None of which I had on hand during the cold snap. It was still great plain. Remind me to buy more cumin next time I’m out. Thanks. If you’re using dried beans, pour them into a large colander, pick out any stones, stems, or beans that have shriveled or otherwise look funky, and then rinse them well. Put the beans in a large pot, cover with water, and bring to a boil. If the beans throw off a layer of foam, you can skim it off at this point. Reduce the heat to a simmer, add enough water to keep the beans fully covered, and drop in the small, halved onion and the dried ancho – a little trick that adds remarkable flavor to each and every bean. 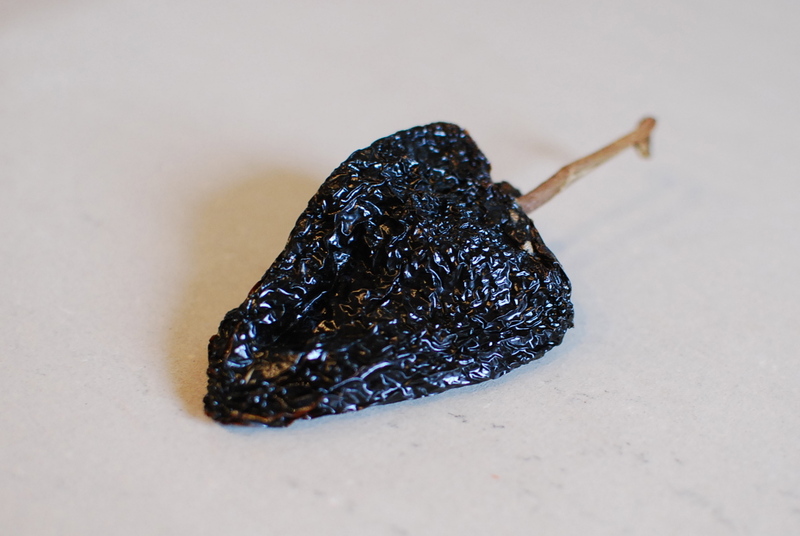 Avoid boring beans: Add an ancho (dried poblano) pepper and an onion to the pot. Cook, covered, for about half an hour, until the beans begin to soften. Season with a little salt, then cook, uncovered, for another 30-40 minutes, or until the beans are tender all the way through (stop well before they get mushy, though). Drain the beans (save a cup or so of the cooking liquid in case your tomatoes don’t yield enough juice later on), and discard the onion and pepper. Wash and dry the pot (or use another large one). Heat the olive oil over medium heat, then sauté the onions and celery until soft and fragrant—say, 10 minutes. Add the garlic and cook for another few minutes. Dump in all the dried spices, and stir well. You’ll likely have a thick paste. No worries. Add the turkey, breaking up any large chunks with the back of a wooden spoon, and brown (another 10-15 minutes). Stir it around frequently, both so it doesn’t burn and so the spices get fully incorporated with the meat. When the turkey’s fully cooked, skim off some of the fat if you need to. Now pour in a splash or two of good beer. Why good beer? Because you’re only going to use a little bit here, and you want to be able to enjoy the rest of the bottle. Stir for a minute or two until the alcohol is all cooked off. Add the beans to the pot, along with the tomatoes and the corn. Simmer on low for at least a half hour and up to two hours. Stir occasionally. Add a bit of the reserved bean water if you need more liquid. 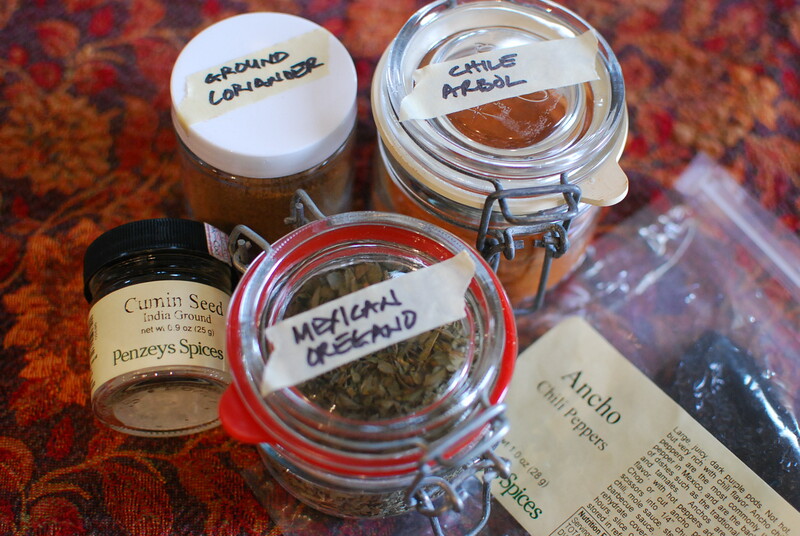 Taste occasionally, too, and adjust the seasoning, keeping in mind that the heat will intensify on its own over time. Every batch is different. And that’s the way it should be. I got four pretty big bowls out of this batch, and froze a couple more for lunches down the road. IPA, all the way. 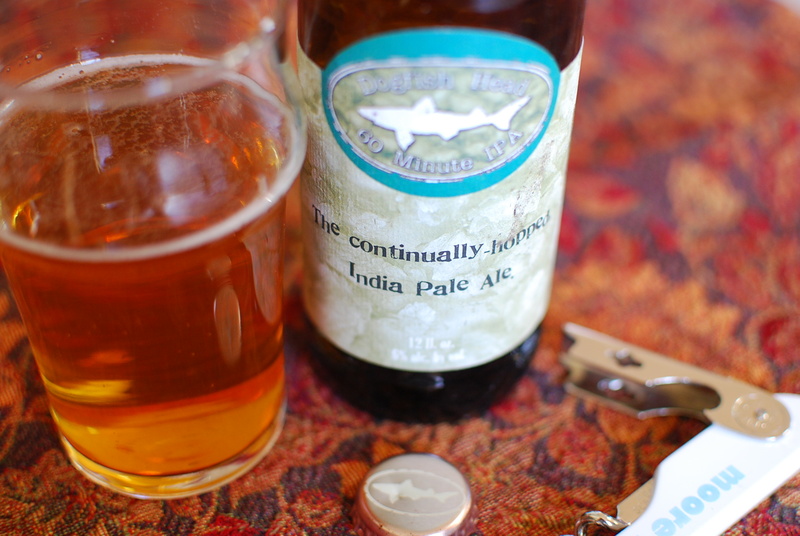 Dogfish Head’s 60 Minute IPA avoids the overly hopped, over-the-toppiness of so many IPAs out there. Beautiful, citrus-peel aromatics, refreshing acidity, and a palate-cleansing balance of bitter and sweet. Terrific with spicy food. Delaware-based Dogfish Head calls 60 Minute their “session IPA.” This session included two bottles. I think this might be a chili day too but it’s er, um, like 70! We topped. 60 here today, too, Tammy. Crazy. Any thoughts on freezing some of the many potatoes I’ve been getting in my CSA? Heather, I, too, have been finding it hard to keep up with the potato bounty in my Winter Share (truth be told, I even still have a few leftover from the Fall season). I don’t have much personal experience freezing potatoes – with one exception. I parboiled them (peeled), let them cool, shredded them, formed them into hash-brown “patties,” and used paper towels to squish out as much moisture as I could before I put them in freezer bags. They tasted fine, though I did “blot” them again after I thawed them but before I fried ’em up. If you try another method (see here for a starter, please let me know how it works out. Thanks for reading!